Can you believe Thanksgiving is next Thursday?! I swear it sneaks up on me every year. 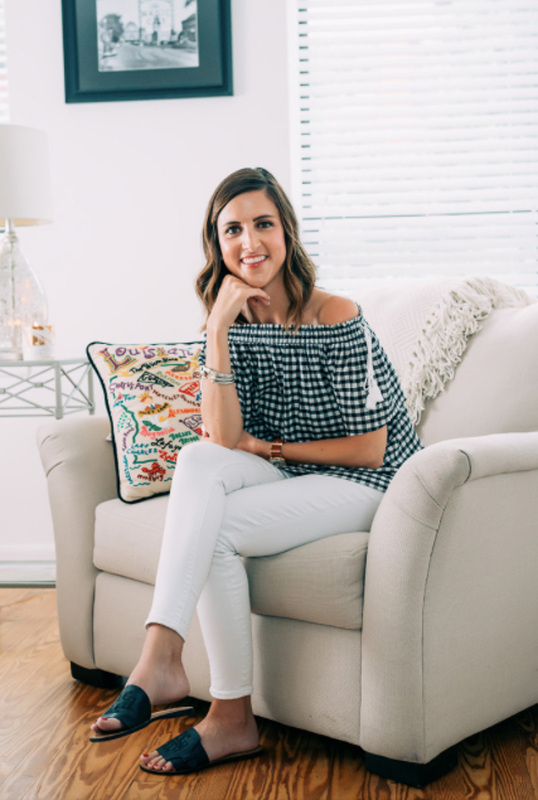 Today I thought it would be fun to share my Thanksgiving traditions with you plus a few outfit ideas to help you pick out something to wear to your Thanksgiving Day festivities! I like to think my family does Thanksgiving in a pretty unique way. Every year, for the past ten or so years, my mom, dad, sister, brother-in-law, and I have ventured to Dallas to meet my aunt, uncle, and cousins to watch the Dallas Cowboys play on Thanksgiving Day. A lot of people don’t realize that the Cowboys and the Lions play every single Thanksgiving Day. The Lions have the early game and the Cowboys have the late one. We usually head out to the stadium around noon. Don’t worry, we don’t miss out on a Thanksgiving feast, we actually have two! At our tailgate there’s usually turkey, stuffing, mashed potatoes, green beans, pumpkin pie, pecan pie, you name it! After tailgating and cheering on the boys to a victory, we usually head back to my aunt and uncle’s house for Thanksgiving dinner. My mom and aunt make all of our favorites – corn bread dressing and chocolate pie takes the cake for me! This year I’ll be driving over to Dallas with my family from Shreveport early Thursday morning (it’s a 3ish hour drive) so I’ll be all decked out in my game day gear starting that morning! 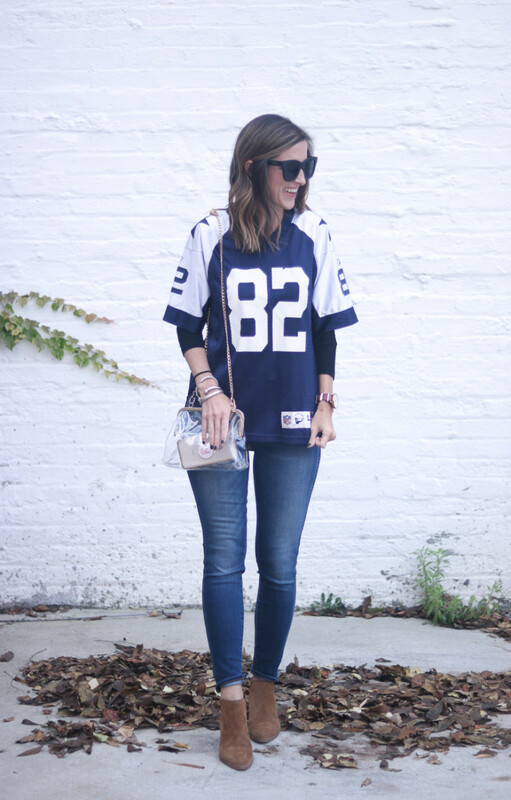 I generally wear the same Thanksgiving outfit every year – jeans, booties, and my Cowboys jersey (I’m still rocking the Jason Witten jersey)! It’s usually a little chilly so I always layer a long sleeve tee underneath the jersey. If you’re heading to a family lunch, I’d recommend keeping it cozy and casual. I’m obsessed with the fringe details on this sweater. I picked it up a few weeks ago and have already gotten so much wear out of it! Another idea, pair a pretty plaid scarf (ASOS has the best scarf selection!) with a cream sweater or snag this perfect oversized turtleneck sweater to pair with jeans and a cute pair of boots! If your Thanksgiving Day plans are a little more fancy, try pairing a dress with a suede jacket and either over the knee boots (currently on sale!) or heeled booties! Another option, I love the idea of pairing a sweater dress with heeled booties or a fun heel! Let’s be real, by the time 3:00 pm hits, we’re all pretty much in a food coma. Grab a pair of cute leggings, a black tunic, and an oversized cardigan to throw on for post-turkey lounging! Need more Thanksgiving outfit inspiration? 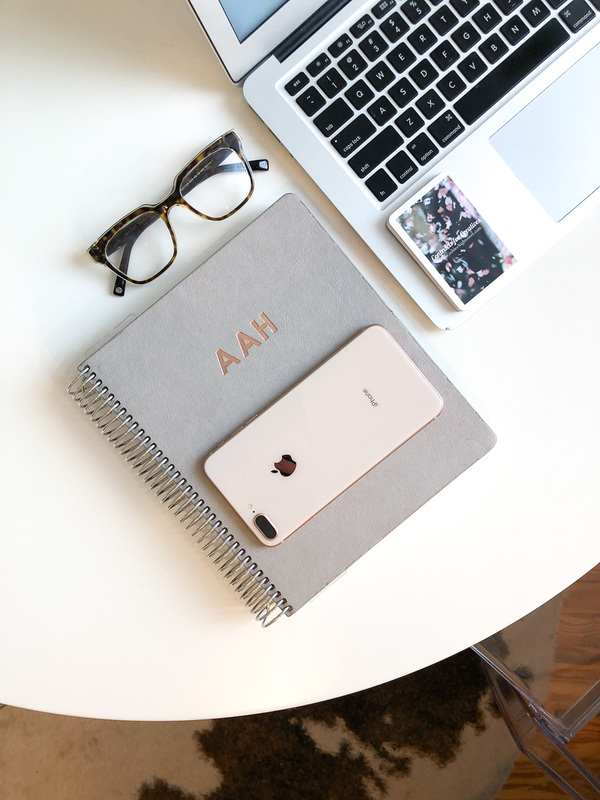 Check out this past post on Thanksgiving outfit ideas! How do you celebrate Thanksgiving?! Any special Thanksgiving traditions of your own?! I also live in Dallas and we watch the game on our comfy sofa in our post Turkey stretchy pants! One year my mom donated her Christmas decked out house for the Catholic Charities Holiday Tour of Homes Fundraiser Event, the deal was it was happening right around Thanksgiving, so to alleviate mom’s stress about what to do about Tom the Turkey, I hosted Thanksgiving that year and have continued hosting ever since and really enjoy it. Being the oldest of 7, I am able to spread out the responsibility and have everyone bring something. At least one of my brothers comes by on Wednesday to help with the prep work and usually everything is ready to go. We eat about 11:30 with appetizers and Bloody Marys for anyone who comes early to help. I roast the turkey and do several other dishes. My youngest brother always fries a turkey and the middle brother always clamors for something pumpkin even though no one else will eat it. As we celebrate November birthdays (4 of them) at Thanksgiving, I make a $100 cake, it’s a chocolate cake that my great grandmother paid $100 for the recipe for to a restaurant in New York a long time ago and as the ingredients of certain things have changed over the years, so has the taste of the cake but as debate always ensues about the taste of the cake…there is never any left over. Jenny – I LOVE this! Thank you for sharing your Thanksgiving Day tradition! I need to come to your house for lunch! haha It sounds like so much fun and SO much good food!